Google today announced new guidelines and an updated PageSpeed Insights tool to help webmasters optimize their mobile pages for best rendering performance. In short, the goal is to make the mobile Web faster by prioritizing how content loads. 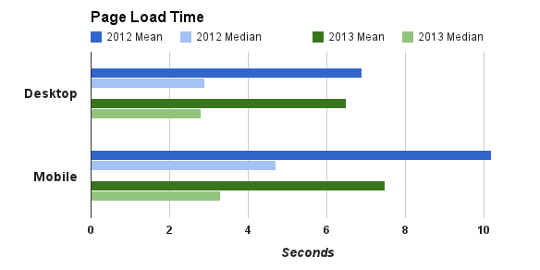 Google wants to bring down the average load time to under one second. That isn’t just a neat figure to aim for; the company points to research by the Nielsan Norman Group that shows users’ flow is interrupted if pages take longer than one second to load. Now, loading pages in a few hundred milliseconds is no easy feat and frankly it’s often impossible with the technology available today to most users. Google insists, however, that sub-second rendering is possible for all the above-the-fold content on mobile networks, with the rest of content loading later. Number of redirects should be minimized. Number of roundtrips to first render should be minimized. Reserve time for browser layout and rendering (200 ms). If you want to help Google in its mission of speeding up the (mobile) Web, check out the company’s mobile-specific help pages. Before and after you make changes, test your pages using the PageSpeed Insights tool to see whether you made any improvements.